Tea is one of the more popular beverages in Russia with the average person drinking over 3 pounds a year! Russians consider it customary to always offer guests tea, and it is polite to accept tea if offered. They even have a saying — having a “sit by the samovar” — to describe tea served with a bit of food or a light meal. If you’re just interested in how to brew tea Russian style, skip to preparation. The traditional process of preparing Russian style tea starts with heating water in a metal container called a samovar. When the water is boiling, some of it is transferred into a teacup that sits on top of the Samovar. The water in the teacup is mixed with a large quantity of tea and brewed for an extended period of time. This creates what is referred to as the zavarka tea concentrate. When the drinker wants to enjoy a cup of tea, they mix some of this tea concentrate with hot water from the samovar. The ratio of zavarka concentrate to water can be adjusted to make the tea stronger or weaker. Since it is served from concentrate, the tea can be enjoyed long after brewing. Samovars are often held as family heirlooms and can serve as the centerpiece of the dining table. Wealthier families in Russia used to have decorated samovars made of fine metals. 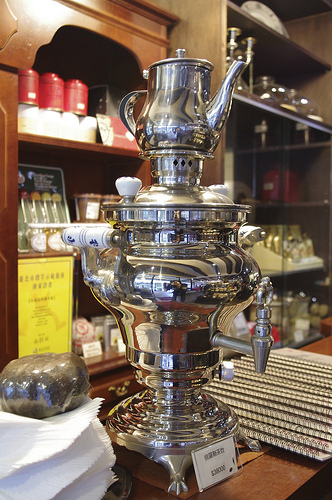 The samovar has a history that predates zavarka brewing and was originally used as an economical way to heat water. Old clay Samovars can be traced back hundreds of years, but the first modern Samovars were first created by the Lisitsyn brothers in Russia in 1778. They are credited with much of the style that exists in metal samovars you see today. 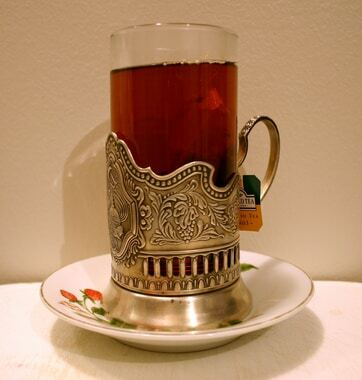 Russian tea is traditionally served in glass cups held in metal encasings called podstakannik. These metal holders are decorated with a similar amount of intricacy as the samovar. However, both the podstakannik and samovar are mostly used as decoration pieces today. With the advent of electric kettles and ceramic tea cups they serve little functional purpose. Any type of tea can be used to create the zavarka concentrate and it is simply a matter of personal preference. 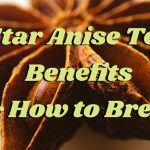 Often times you will want to use a blend that will not go bitter after longer periods of brewing. 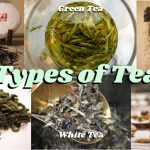 Darker and more oxidized teas are better suited than green or white teas. Herbal and fruit teas are also a good option because they don’t contain any catechin compounds that make tea bitter. Or you can combine both into an herbal blend to create complex aromas. Measure 1 heaping tbsp. of Russian Caravan tea or black tea per cup of tea you want to brew and add it to your teapot. The more tea you use the better. Fill your teapot with just enough water to cover the leaves and a bit extra. You want your Zavarka to be concentrated. (Optionally) Add some high quality jam, fruit preservative, or other sweetener to your tea. Let the tea brew for about 15 minutes. Ideally you want the leaves floating back up to the top of the water. Pour the hot water from your electric kettle into your tea cup and add some of the Zavarka concentrate. Adjust the balance of water and Zavarka to your taste. Once your tea is ready, make it a proper sit by the samovar with a light snack. 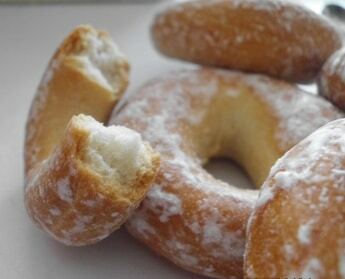 The most popular food to eat alongside Russian tea are Sushki cookies: little donut shaped bread rings that are made to be dipped into tea. Russians also serve their tea with food boards such as meat & cheese, or any other type of snack. 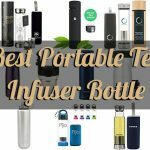 I started this website to share my passion for tea. I’m new to the tea scene but hope to learn more over the coming years and share what I learn with you guys along the way. © 2018 Tea Culture Worldwide. All rights reserved. Tea Culture Worldwide is a participant in the Amazon Services LLC Associates Program, an affiliate advertising program designed to provide a means for sites to earn advertising fees by advertising and linking to Amazon.com. No additional cost is charged to you and I don’t link to products that I wouldn’t recommend to friends and family.